Ji Yishun’s redware work Rising to the Sun. 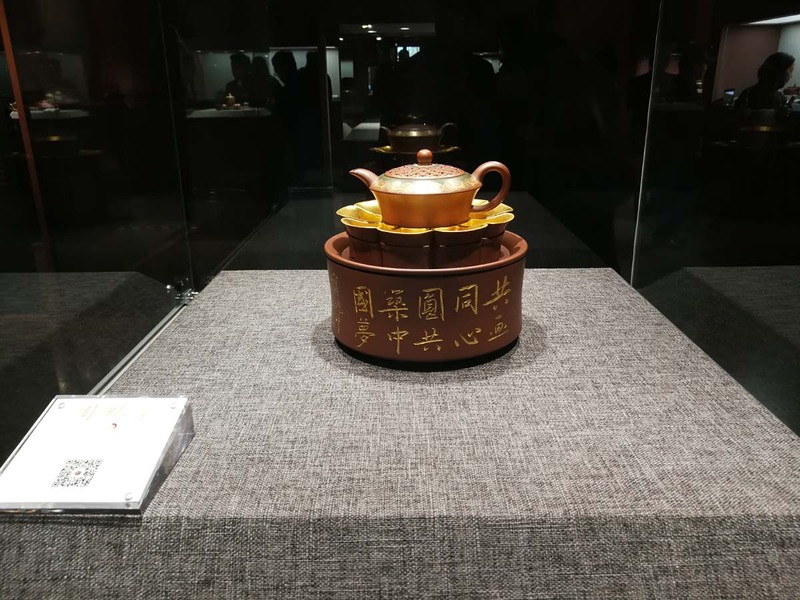 The series contains 12 pieces centered on the teapot, with nine cups, a plate, and a serving pot, expressing the master’s praise of China’s prosperity, happiness and joy. The exhibition features over 60 redware works designed and created by Ji Yishun, a master of Chinese arts and crafts. Many of the pieces on display were created for the 70th anniversary of the founding of the People’s Republic of China. 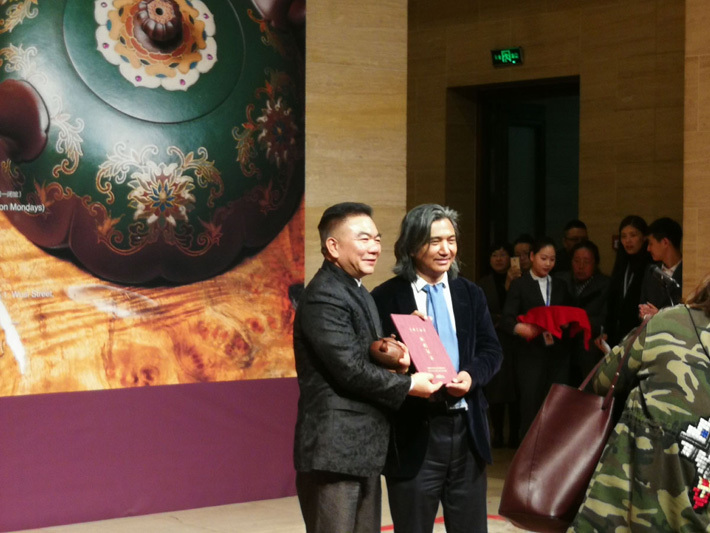 At the opening ceremony, Ji Yishun donated his work to the National Art Museum of China, and curator Wu Weishan presented him with a donation certificate on behalf of the museum. March 30, 2019: At the opening ceremony of Ji Yishun Redware Work Exhibition, Ji Yishun donates his work to the National Art Museum of China, and curator Wu Weishan presents him with a donation certificate on behalf of the museum. As the signature variety of Yixing ceramics, redware has been passed down for hundreds of years, and has become an intangible cultural heritage of the country with its unique hand-pressing techniques. Ji Yishun’s redware works Dragon and Phoenix (left) and Peony (right). Ji Yishun was born in Yixing, Jiangsu Province in 1960. At the age of 17, he first became involved in the redware pot industry. Over more than 40 years of experience in this field, he has created more than 300 sets of ceramics and become a prominent inheritor of Yixing redware production techniques. He was awarded titles such as “national master of arts and crafts” and “national master of ceramic art” and earned the reputation of being one of the “Four Asian Tigers” of the redware industry. Ji Yishun’s redware work Everlasting Prosperity. It is inspired by the heavenly bamboo and the pumpkin, and represents permanent wishes for the better. His work mirrors his spirit and soul, which combines colored and neutral-colored elements, and beauty and practicality. 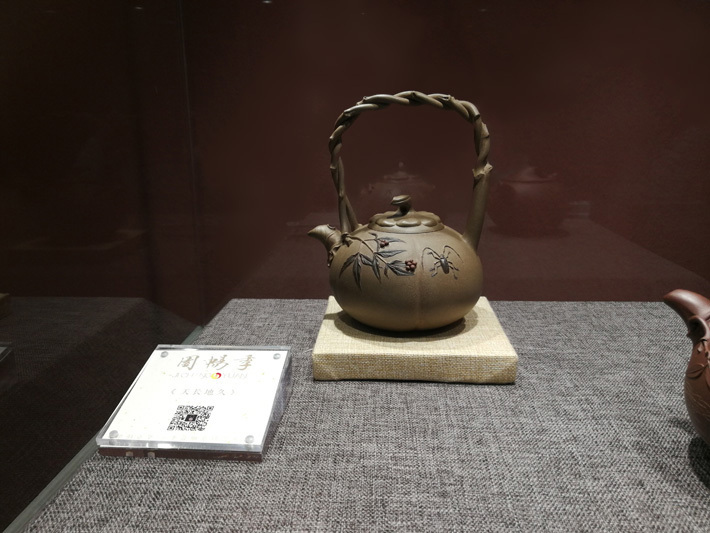 On October 30, 2018, the Jichangyuan Redware Art Museum established by Ji was selected as an intangible cultural heritage base for Chinese artists. 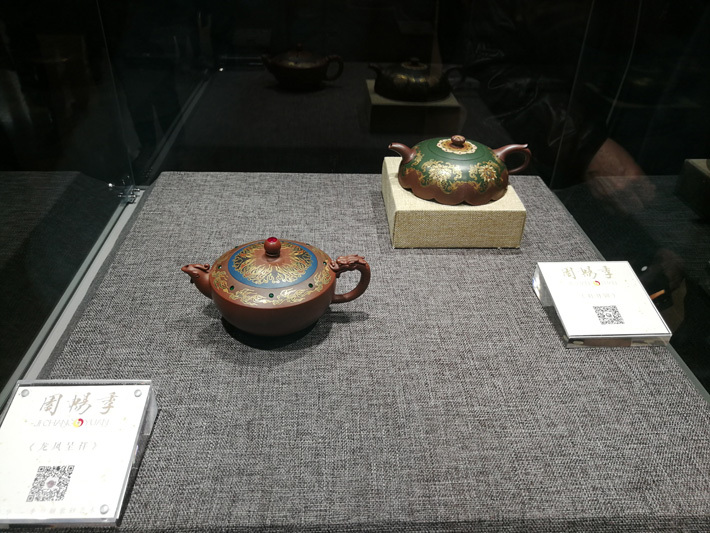 The exhibition, hosted by the Publicity Department of Yixing Municipal Communist Party of China (CPC) Committee and Jiangsu Ceramic Industry Association, co-hosted by Yixing Culture and Sports, and Tourism Administration and Jiangsu Folk Literature and Art Association, and organized by Yixing Jichuangyuan Redware Culture and Art Co., Ltd, runs until April 7, 2019 (closed on Mondays).